What I like: It's a game not afraid to do things differently. Card-based conflict resolution. Not So Much: UI makes many actions more inefficient than it should be. Lack of variety can make game feel a bit repetitive. Other Stuff You May Like: Developers say they plan to expand via free DLC! The Verdict: May appeal to players on the lookout for a strategy games that play differently than the norm and are willing to put up with UI inefficiencies. Disclaimer: A review copy was provided by Muha Games. The land of Thea has been plagued with darkness, but recently there has been a glimmer of hope. The sun has started shining, albeit weakly after years of absence. A small band of villagers has banded together, trying to survive, trying to rebuild a community. With the returning light, they are willing to move a little farther outside the confines of their village. At first glance Thea would appear to share similarities with games such as Civilization or Warlock, but it doesn't take long to figure out this isn't the case. Looks like a Civ game, but don't judge a book by its cover. At the start of the game the player chooses a god, determining the perks that will be received. The god gains experience which carries over from game to game and grants more perks. A total of 8 gods are unlocked with play, but I'm not sure what the criteria is to unlock them. Zorya is the fine lady who provide guidance during my initial quest to save Thea. With her earned experience she'll be even more powerful in the next game she's selected. 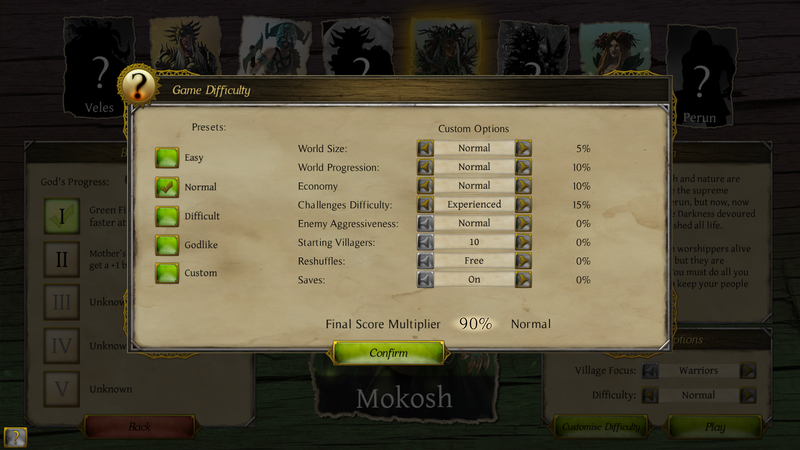 There are a handful of settings available to tweak different aspects of the game. Two interesting things to note are the Reshuffles and the Saves options. Conflicts are resolved by playing a card-based mini game. Reshuffles allow the player a 'do over' if they don't like the initial shuffle. Thea has an odd save game system. Thea will generate an autosave every 5 turns and when quitting the game. The Save option allows the player to also save any time. The odd thing is that there is only one save file at any time. This means that if you start a new game, your prior game is automatically ended. You can only have one game going at a time. I'm guessing this is because of the god unlocking system. In general this probably isn't a problem unless you like to have multiple games going on at once. Changing the difficulty has an effect on the final score. 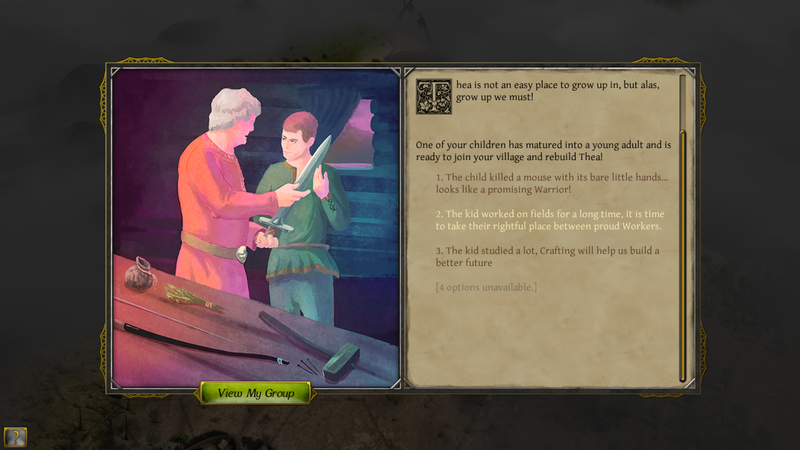 The tutorial and in-game manual do a nice job explaining the game's concepts. The tutorial guides the player with a series of missions, explaining concepts as needed. The manual provides a little more detail but doesn't go into all of the nuts and bolts. The developer was quick to fill in the details on Steam with the few questions I had. In Thea you will only have one settlement. Always. Remember how I said this isn't like Civ? I wasn't kidding! In this settlement your villagers can gather the resources within the immediate vicinity, craft tools, cook food, and make weapons and armor. They are basically the support staff for your more adventurous people who go on expeditions. Don't equate staying in the village as staying safe though. Wandering bands of creepies will come and visit, so leaving some protection behind isn't just a good idea, it's necessary. In the beginning the villagers won't have great equipment. They'll carry the most basic weapons (when they have one), most have no armor, and no tools to help them accomplish their tasks more efficiently. 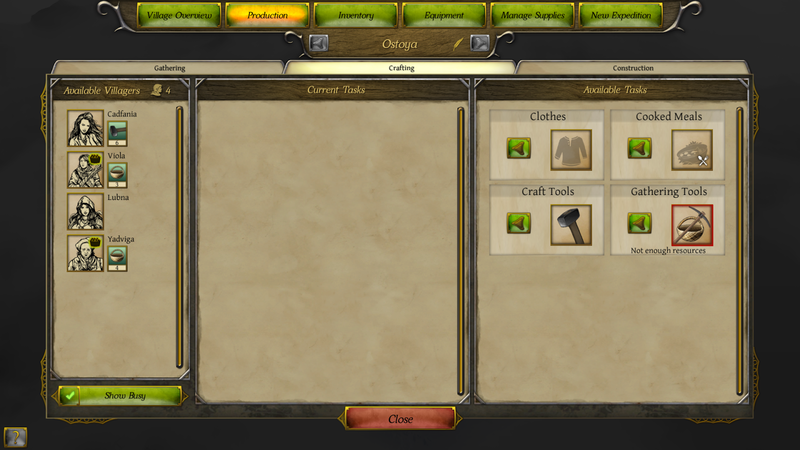 Crafting helps villagers become more effective by creating better equipment. 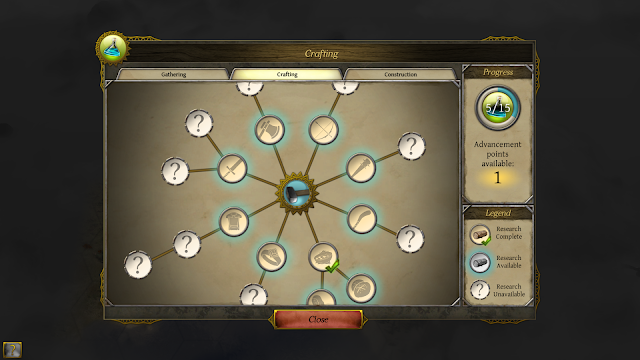 The initial items available for crafting are very basic, but more are unlocked after acquiring research points. Limited choices at the start open up with some research. Each crafted item requires a recipe of ingredients. For example, clothing can be made up of a combination of string and leather. The basic variety of string and leather will create basic clothing. Using more advanced string and leather material creates better clothing. Unfortunately for your villagers, their initial supply of materials is of a limited quantity and quality. 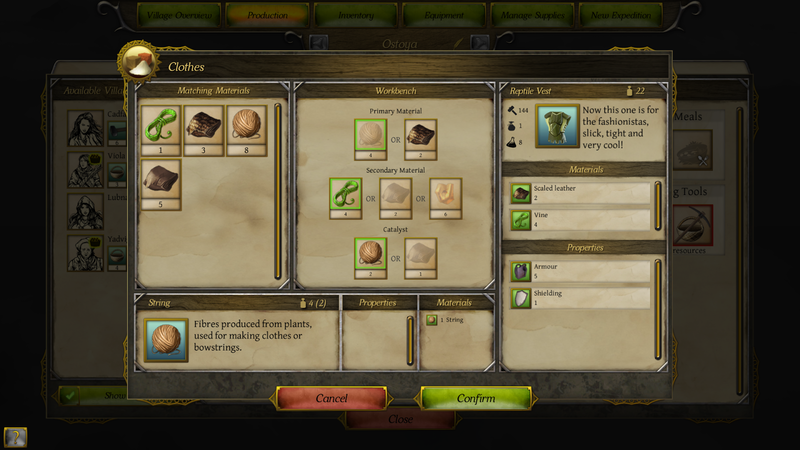 To craft an item, select the type, choose the resources and assign one or more workers. Presto! 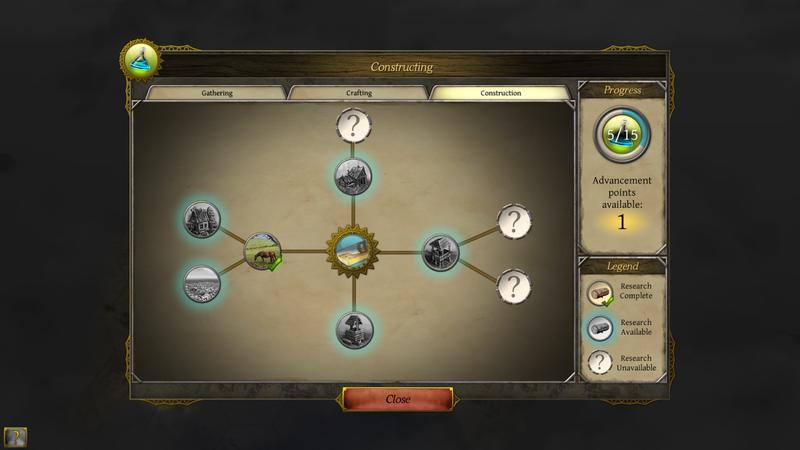 You get an item in a number of turns, based on the effectiveness of the assigned workers. 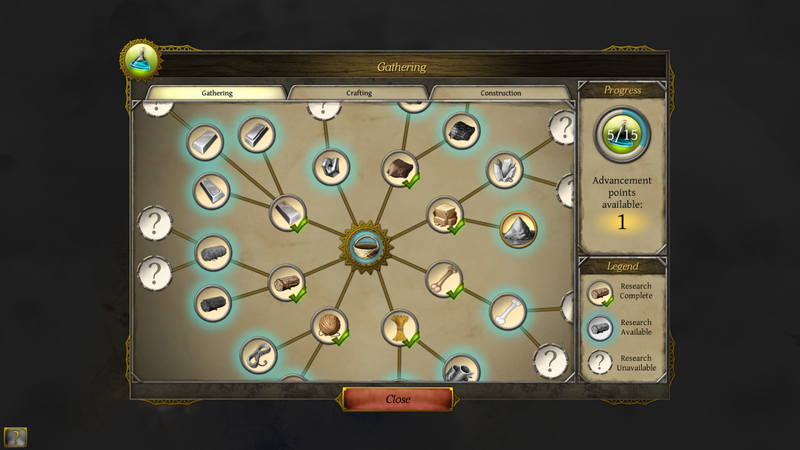 A number of research points are also added to your pool, which will be used to unlock more crafting and gathering choices. Since research points are given for crafting, it feels like the little guys and gals are learning by doing instead of sitting up in some dusty library performing research. Using different materials can create items with different benefits, weight, research points and labor required. I could use basic string to create a shirt, but using scaled leather and vine creates a reptile vest, offering more protection and research points. As research unlocks more materials, testing out the different combinations becomes more time consuming. The min / maxer in me needs to test all of the combinations, even if the process can get tedious. It would be nice if the game kept track of tested combinations and what the effects were, maybe allowing the player to select a combination from a list. Without some pen and paper I can't remember what the different combinations do. The settlement is limited to 10 buildings with a total of 9 types to unlock, so city development isn't a huge part of the game. Constructing buildings is handled the same way as crafting items, with the materials affecting the quality of the structure and the benefits it conveys. Adults can contribute immediately, but when a child comes of age they can be assigned a class, which helps to fill a specific need. Like any good human resource manager acknowledges, people are your greatest asset. You need people to collect resources, cook food, create weapons, build structures, fight enemies, talk their way out of jams, cure diseases, sneak past monsters...the list goes on. Matching people's skills to the right job can make life much easier. Each person has a class, which defines where they will likely excel. 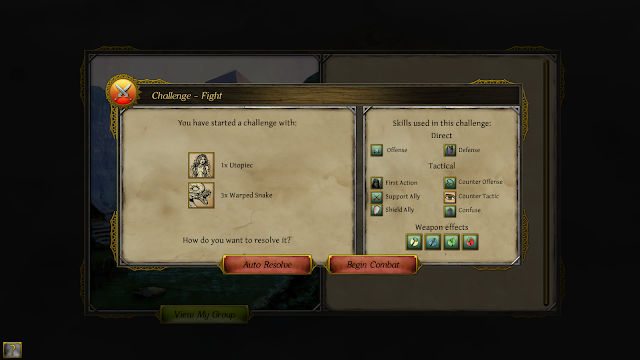 People in Thea have many attributes, and like mentioned above not all of the challenges are related to combat. Your buff soldier may be of little use talking her way out of a jam. It's pretty safe to say your party of villagers will encounter some combat, so having an adequate amount of warriors is paramount, but you never know what other skills will be of value. It pays to try and bring a diverse group of people on expeditions to cover the bases. The game needs a roster grid where villagers' skills can be easily viewed and compared all at once. Taking stock of villager skills requires clicking each one and taking note of their stats. Sometimes the UI is the biggest enemy you'll encounter in Thea. Expeditions serve to explore the landscape for resources and points of interest. The group needs to bring food from town to avoid starvation, but can supplement their supply with foraging if a source of food is found. More resource deposits are available as research unlocks different resource types. There are also locations to explore, often accompanied with little text adventures. The available choices are driven by your party's skills. Combat, or some other type of challenge is often involved. Sometimes a little exploration can net some loot without fighting! Like many games with inventory management, this is easily one of the more tedious aspects of the game. Each villager needs to be selected to determine what equipment they have. The new items have to be manually compared with the existing equipment to see which one is better. To make matters more difficult there isn't a way to highlight items recently added to the inventory, so it can be a pain to determine what the new items are. When only one new item is acquired it isn't difficult to remember what it looks like, but there are times when more items are acquired at once. 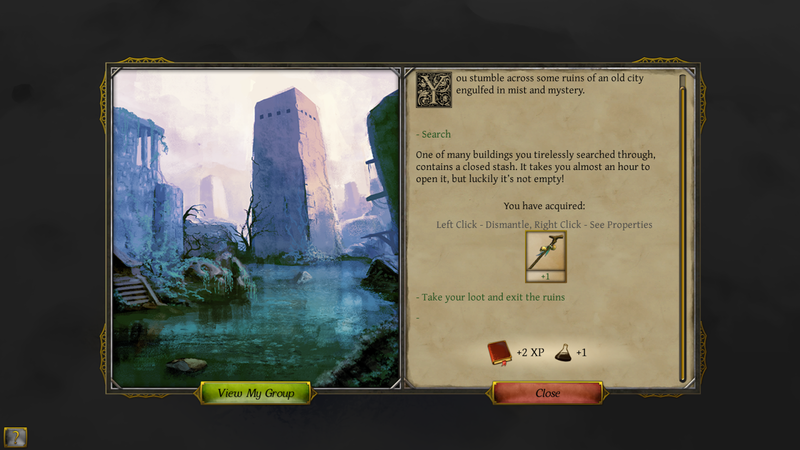 It won't take long to find a lair, which spawn groups of enemies that will harass your expeditions and village. Killing off the lair will remove one source of trouble and help acquire some loot in the process. Sometimes there are options with how to handle an enemy. Non combat actions tend to be less risky as damage inflicted doesn't carry over after combat. Sometimes the are consequences for failing a challenge, so they aren't risk free. There is a general indication regarding how tough an encounter may be. Viewing your group and filtering the skills by challange type can help decide which may lead to the easiest success. I missed that filter for the longest time. Again, I wish there was a roster screen that displayed the abilities for all of the villagers at once, in a grid. Events aren't always tied to exploring a location. 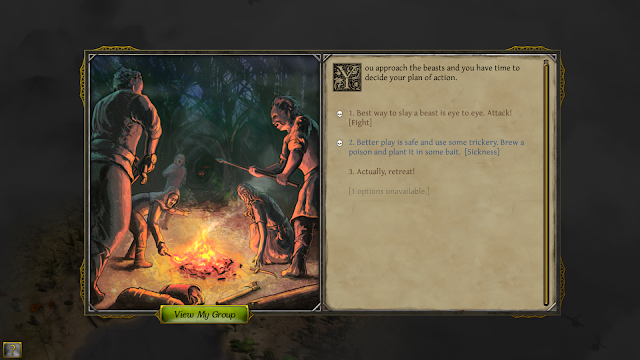 Random events will occur throughout the game, and provide the opportunity for some choices - unless your party doesn't have the prerequisite skills. It's always a bit frustrating knowing there are some choices I didn't get, wondering what I was lacking. I don't mean this in a bad way. My curiosity gnaws at me knowing I'll never know the answer. Well, I may get the event again in the future when the prerequisites are met. There are many situations that lead to combat. 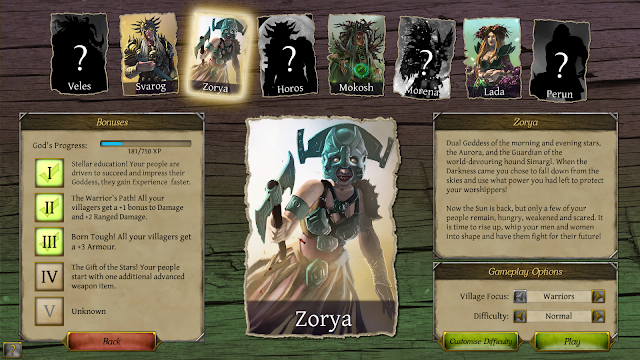 Your success will depend on the villagers' attributes, equipment, and your skill in the card-based combat. Before entering battle the number and types of enemies are revealed, but no information about them - even if you have fought creatures of that type before. Surely you can see if they are carrying spears instead of swords, or remember the piercing bite of the snake you've encountered earlier. You either need to rely on memory or take notes. Luckily the card-based resolution system is pretty fun to play. It begins with a planning phase. Half of the cards are ready to enter battle, and the other half can use tactical abilities to aid their comrades. Once the planning phase is done, combat moves to the resolution phase where damage is done. The system is pretty simple, but has enough nuance to remain interesting throughout the game. Basically, each card has the ability to inflict and absorb damage. Also, their level determines if they can resist some tactical effects. 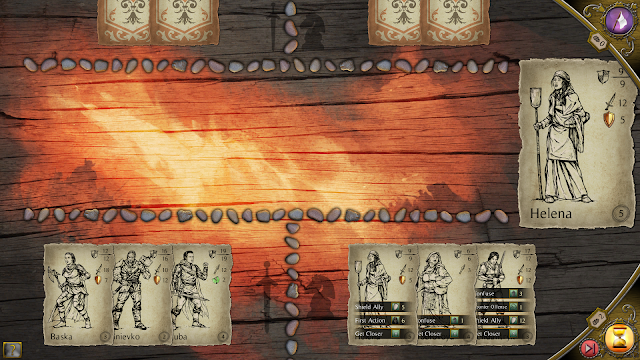 Each side takes turns placing cards on the table, or using the tactical effects. It is these tactical effects that make the battles interesting. There are 3 basic damage types. Slash damage has no unusual effects. Blunt weapons can use any remaining damage after a kill to damage a second enemy. Normally cards enter the battlefield from left to right, but a card that inflicts piercing damage is placed just before the last card if it is an enemy card. Kuba above has piercing damage so he can injure the Utopiec when he enters instead of waiting until the resolution phase. Since he's entering to the left of Utopiec, he'll get to attack before she does. The cards on the right hand side are in the tactical group. They can't enter the battlefield ready to inflict damage, but they can use their abilities. First Action can move your last card to the front of the line. Support Ally increases the last ally's attack, while Shield Ally increase their defense. Counter Offense and Counter Tactic can remove an unplayed enemy card from the round. Confuse makes the enemy card skip a turn. So, the flow of the battle can change based upon the tactical skills used. Enemies can also have these skills. 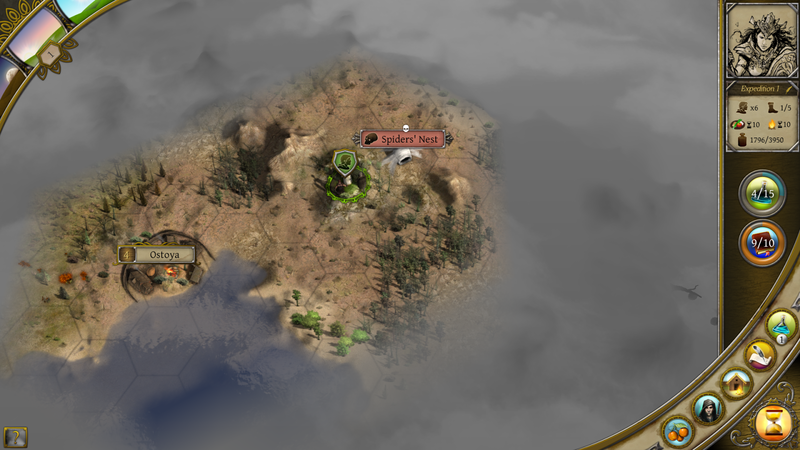 The AI seems to play a good game. Once the planning phase is complete, cards attack from left to right. A card randomly attacks the closest enemy to either side, so it doesn't always play out how you want it to. If the battle isn't finished after 2 combat rounds, the cards that haven't had their health reduced to zero are reshuffled for a new planning phase. This means that your options can change as the battle goes on. It's important to note that all conflicts are resolved using this card game - combat, diplomacy, hunting, etc... Different attributes affect the outcome though. Damage and armor are used to inflict and absorb damage in a fight, but in a diplomatic challenge the attributes used are speech and willpower. The same tactical abilities are available, but are also powered by a different set of attributes. This is why it's important to have a diverse set of skills in your expedition parties. The damage a character receives during a fight heal with time once the fight is over, or can be healed at a healer's hut. 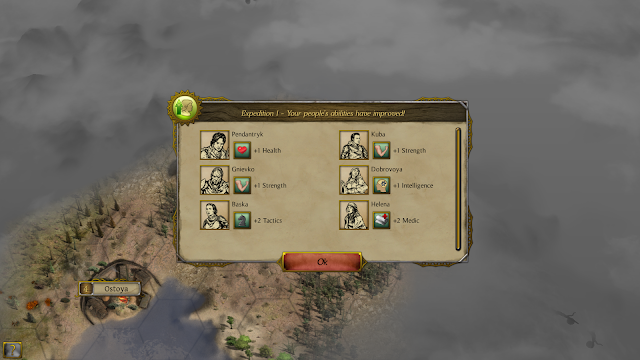 Each turn wounded villagers have a chance to die. If a medic is in the party it decreases that chance of death. Death seems pretty rare, especially with a healer in the party. The card game succeeds and is an interesting, sometimes tense challenge. Choosing the order to play cards and the tactical abilities to use provides many opportunities to affect how the battles play out. 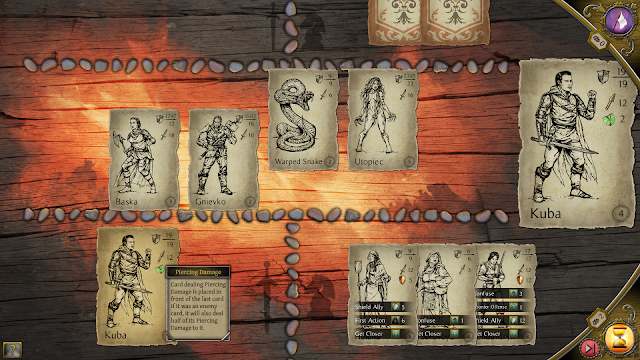 The card mini game occurs many times over the course of a game of Thea: The Awakening. I had to start making use of the auto resolve when I expected an easy win, otherwise it started to get a little tedious at times. I didn't experience any unexpected results when I used auto resolve. It would be nice if each type of challenge had something unique to differentiate them from the other challenge types. Completing events and winning conflicts earns all of the villagers experience. 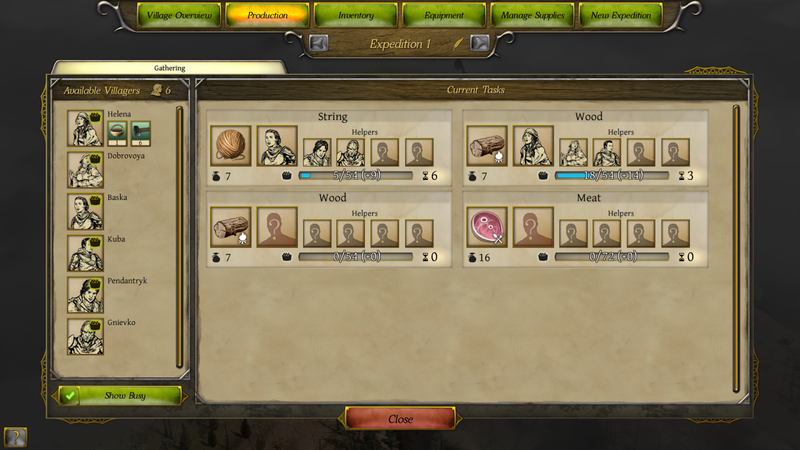 When enough experience is earned, all villagers level up and each improves a random attribute. Class attributes are the most likely to improve, followed by any skill they already have. It's rare, but they can even acquire a skill unrelated to their class. 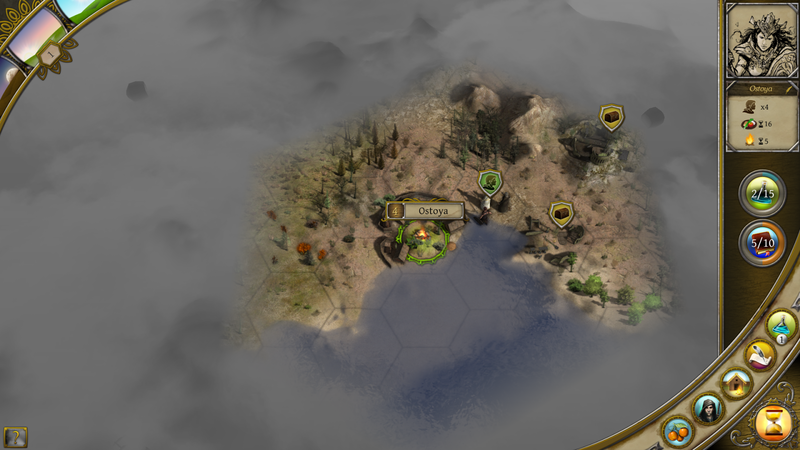 It shouldn't take too long before research unlocks an item - allowing different resources to be collected, new items to be crafted, or new buildings to be erected. Resources further from the center are more advanced and offer greater benefits. Improve your village with a handful of buildings. I found a nice spot to camp and collect resources, but realized I only have 1 person capable of doing so. 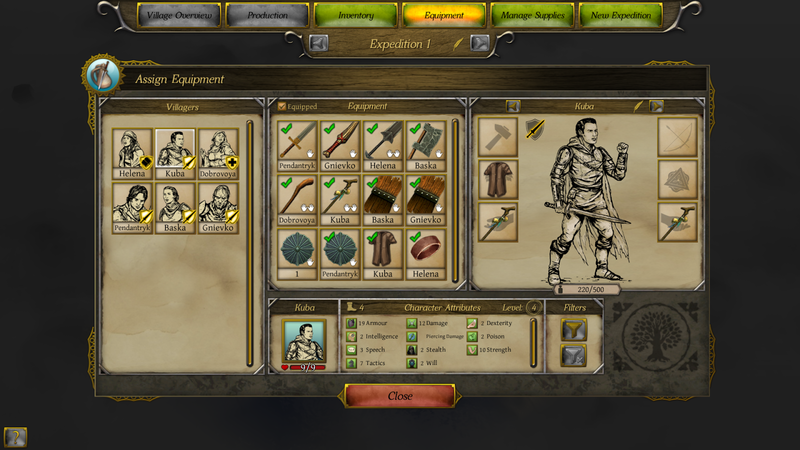 If I can craft some gathering tools my entire expedition can contribute. It would help if I actually had the needed materials to create the crafting tools! A nice spot for camping! My expedition is short on gatherers. Usually 4X games have time scales measured in weeks, years or centuries. Thea is also different in this regard, having a day and night cycle. 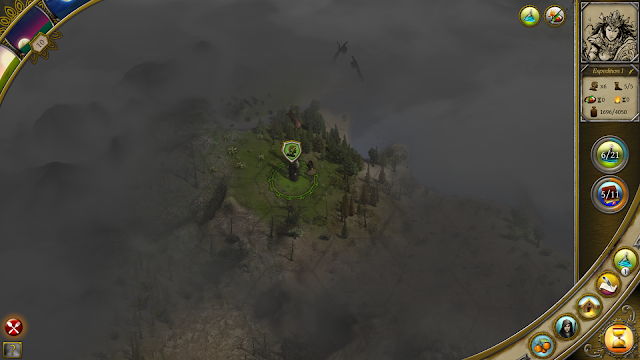 The landscape darkens, making it more difficult to spot enemies or points of interest. Creatures become more emboldened, increasing the risk of attack. It isn't Dying Light nighttime scary, but it is certainly more dangerous. Expeditions need to return home to drop off any harvested resources and loot. That obsolete weapon can be broken down into some useful components used in crafting! The game can be won by following a series of story quests, or fulfilling a set of advancement criteria - population size, research, combat and building construction. I won my game with the story quest. The other criteria seems like it could take a while. I haven't had any crashes since the game left early access. Turn times are fast since there aren't any competing AIs that require a lot of thinking, just the random baddies moving around the map. The graphics are attractive and music soothing. 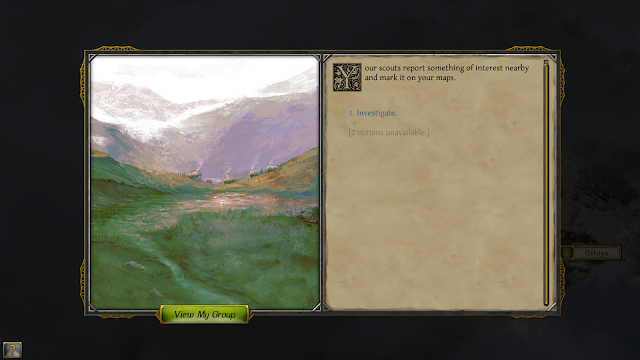 There is quite a bit of writing in the game. It does a pretty good job of painting Thea as a world recovering from cataclysm. It is at its best when the tone is serious. Occasionally there are some morally ambiguous decisions. There is some silliness which didn't quite work for me. My specs: Windows 7 64-bit. Intel Core i& 860 @ 2.80 GHz. 8 Gig RAM. ATI Radeon HD 7870. Thea: The Awakening poses a problem for me. It contains an interesting set of features and isn't a copycat of other games of this nature. Well, I'm not sure how many games are exactly of this nature. It contains some 4X exploration, story based questing, a card mini game, resource collection and crafting, character management. It even contains a meta game of unlocking and leveling up the gods so they provide better bonuses. The day / night cycle for a game this type is really cool. When darkness comes it is easy to stumble into a group of enemies and exploration is tougher. I can tell Muha Games didn't want to make the same game as everyone else. There are many times the user interface gets in the way. A lot. Trying out different ingredients for crafting is both interesting and tedious. Same with cooking up different recipes of food - greater food variety gives bonuses. It's busywork. Did I combine fish with meat or bird meat already? Seaweed? Herbs? I can't remember. Party management requires a lot of clicking. Who can use this new sword? Select a person, look at their equipment, select another. Wait, who was the guy I wanted to have high dexterity? Click back through the people. The game needs a grid to view the skills of everyone at once. Even something as simple as movement across the map is more frustrating than it needs to be. For some reason my group periodically leaves 'movement mode' and I have to reselect the command from the popup menu. 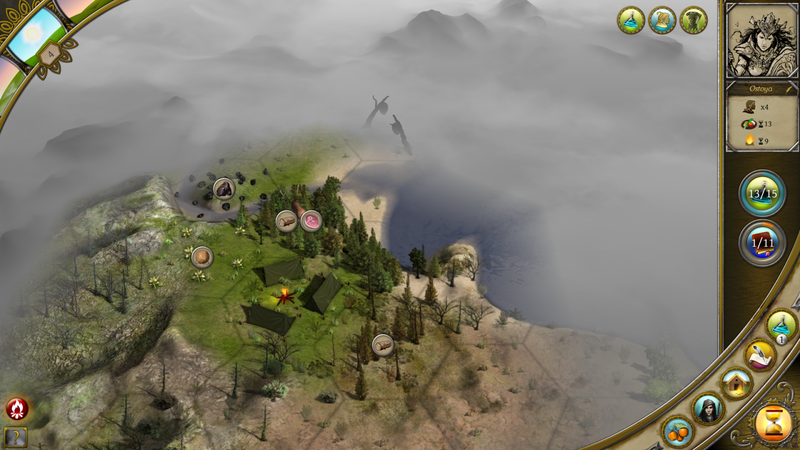 Resources can be difficult to see on the map, but toggling on the resource icons removes the movement point display and points of interest icons. Still, I'm playing a second game and have played for over 30 hours. Sometimes I quit in frustration, but then start it back up later. If you like experiencing games that aren't the same thing rehashed 100 times and have patience to endure a sometimes difficult UI, then you may want to give Thea: The Awakening a shot. It isn't an expensive game with a regular price of $20, $16 until December 1st (on Steam). It's not a huge investment to try something different. But, if you need to be careful with your gaming dollars you may want to hold off for now.